Perfect for Memorial Day. The vase is a stunner. The reflection of the window blinds on the glass makes an interesting effect. Marian, photographing these flowers was a trial as each one of the flower colors is difficult to capture. The vase is signed but I can’t make out the name. Would like to know more about it. 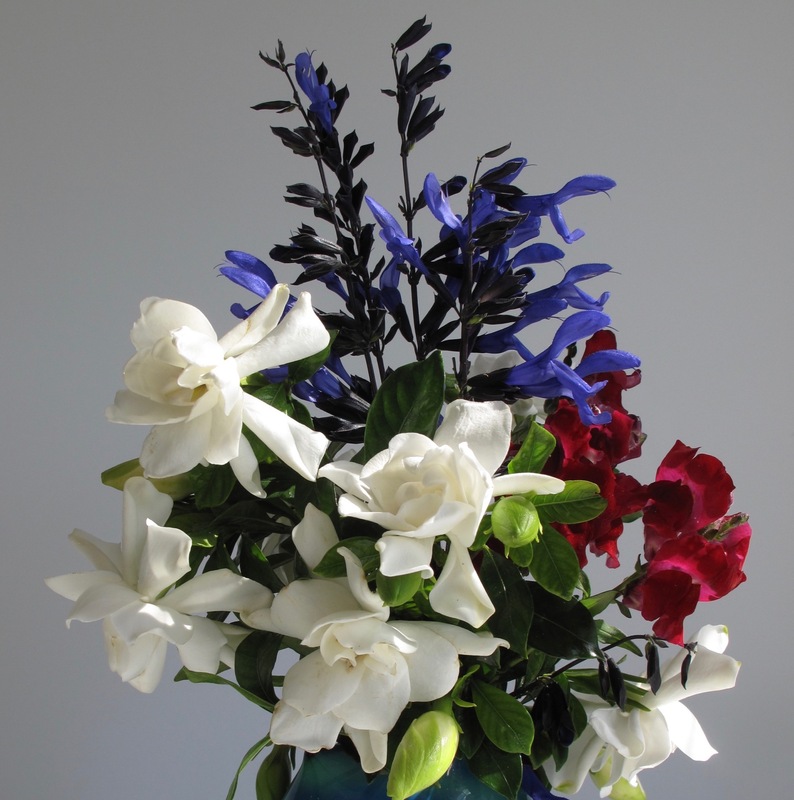 I always love your Gardenias and of course the Salvia. The vase itself is gorgeous, and a lovely thing to have as a memory of your friend. So opposite from last year, we’ve had lots of rain. Both the gardenias and the salvia look extremely healthy. I think the vase is the actual focal point in this arrangement. What a ‘perfect’ arrangement for this special Monday. 🙂 I only wish I could smell their amazing fragrance. Wish you could too Judy. The gardenias do have a wonderful fragrance. Lovely tribute to your friend, beautiful flowers. Thank you. My friend didn’t garden herself while I knew her but she was always generous in admiring my little space. 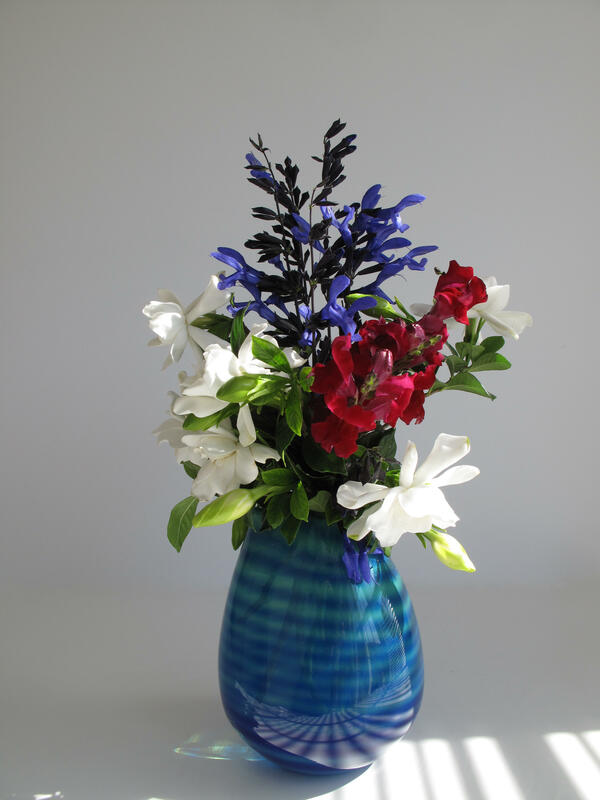 I love the colors of blue in your vase….and a perfect collection of flowers. I wish I had some red flowers but they are not blooming yet. Just gorgeous! Thanks Donna. I’m a fanatic for anything blue and also love those blues. My gardenias are blooming now as well. Perhaps we will feature them soon. They are the best we’ve ever had here. Must have been the winter weather. John, I’ve been attributing the abundance of gardenias to the rain, but you’re right–winter wasn’t so brutal this year. Look forward to seeing your gardenias too. Perfect combination for the day. Thank you. It was lucky to have the red snapdragon today. The first things to catch my eye were a) the glorious salvia b) the beauty of the vase. So nice to have a story about how the latter came to you. Something to treasure and treasure, reminding you of your friend every time you see it. 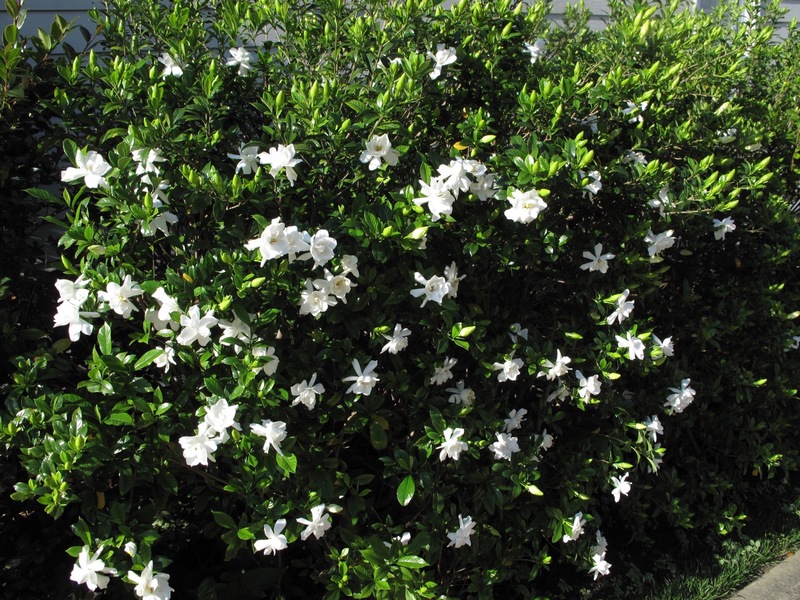 And then I thought – gardenias in the garden! What bliss. All in all a lovely arrangement beautifully (as always) presented. Thanks for sharing. Thank you, Cathy. The black and blue salvia is at its finest this year. I think it has loved all the rain we’ve had. I can almost see it growing! Such a wonderful plant – treasure it! Perhaps the “crispness” comes from how I massed each type of flower instead of interspersing them. Makes them stand out more. I have varying luck with salvias Cathy–do hope yours comes back vigorously. If it gets too dry ‘Black and Blue’ shuts down but is always ready to bounce back at the next rain. The fragrance emanating from the gardenias is heavenly indeed. We both had strongly fragrant flowers today! It’s a beautiful vase and I enjoyed hearing how it came into your possession – it’s histories like that that give the things in our lives meaning beyond their material worth. As usual, you’ve accented the vessel with the perfect selection of flowers. 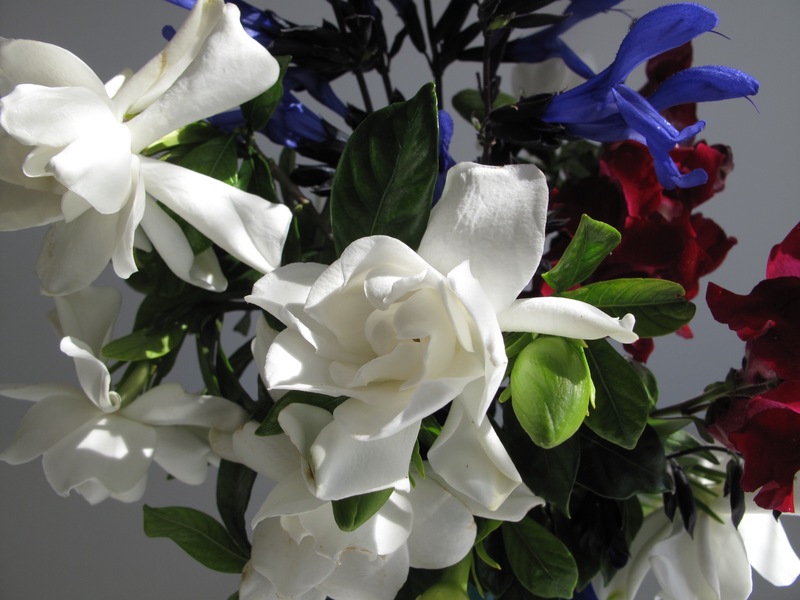 Your gardenia shrub is awe-inspiring! Thanks Kris.. The vase is a special treasure for the associations it holds. Having just opened this week the gardenias were at their freshest. We had rain later and I can already see the flowers on the shrubs turning brown. Thanks Annette. You’re right, the gardenias do smell delicious, a great bonus to growing gardenias. I found your sorrel beautifully presented. Ah, gardenias! I could only wish. Lovely story about your neighbour. My aunt was also in the foreign service: Middle East, Africa, and many years in Latin America. I was lucky enough to spend a summer with her in Guatemala when I was 13. Quite an eye-opener. It is thanks to her that I learned Spanish and now live in Spain. She now has end-stage alzheimer’s/dementia, and believes that she is at a mission working with the “natives”, which I am sure was one of her happier experiences. Funny how the brain works. Karen, thanks for sharing your own story of the foreign service. What a great opportunity that must have been for you to visit your aunt in Guatemala. Quite sad that she now has alzheimer’s. Thanks Cathy. Gardenias are often grown here, but they do retain a sense of the exotic for me too. This year’s display is exceptionally good, perhaps the milder winter and plenty of rain. Photographing these flowers was a challenge. 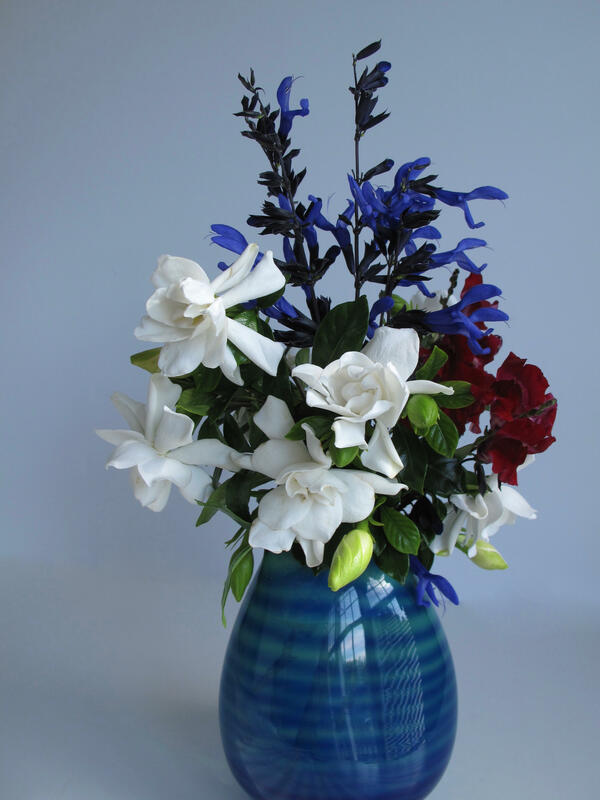 White blooms are difficult, blue are very testy. The light coming made some nice reflections on the table that I wish I’d been able to capture. Have a good week. What a treat to have such a bountiful supply of gardenias to pick. 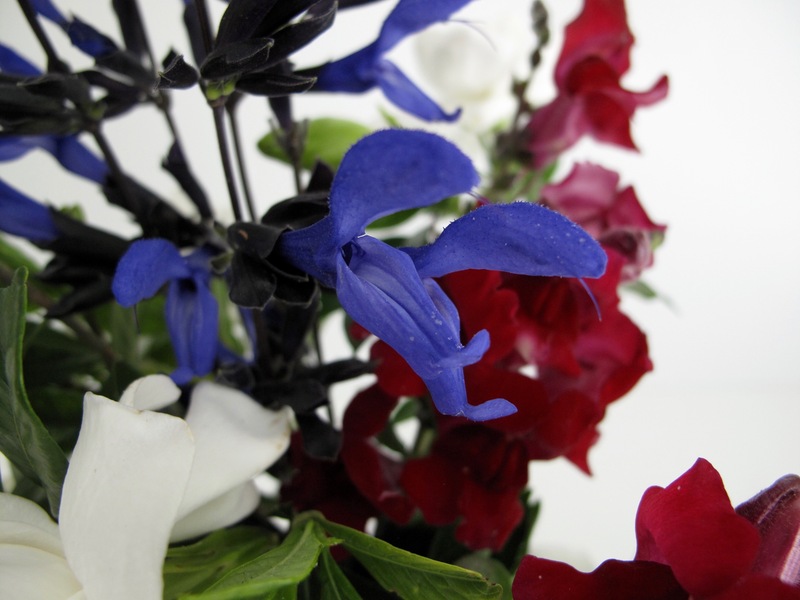 The ‘black and blue’ salvia is gorgeous and works so well with the lustrous vase. Yes, it is a treat when the gardenias start blooming and I can fill the house with their wonderful fragrance. 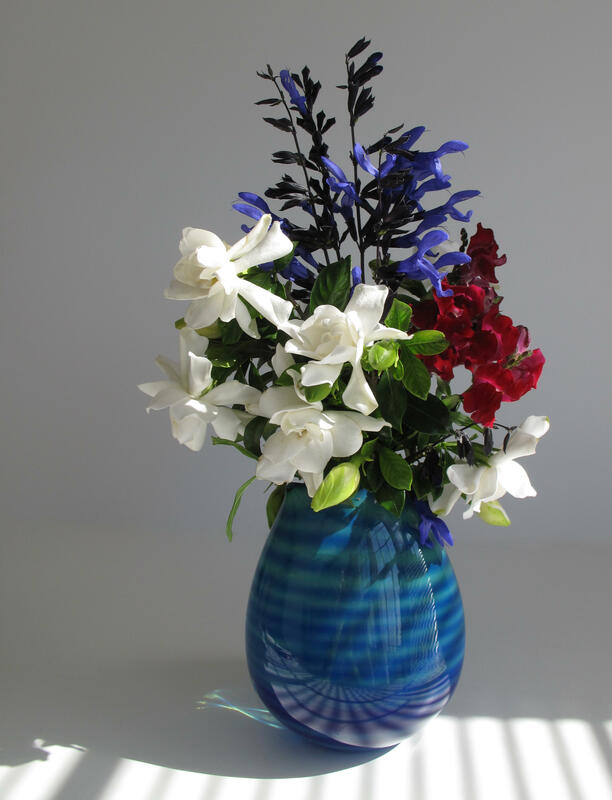 I did hope the salvia’s color was deep enough to balance the strong blue vase so thank you for that comment. My daughter is fond of Julia Child too, your friend sounds as if she was a wonderful woman, the vase and your arrangement are both lovely. That’s wonderful. Julia Child led a fascinating life and your daughter is well on her way too. I read her blog a few times but have lost track of it lately. My friend also led an interesting life. Thanks Julie. Appropriate for Memorial Day and beautiful to boot! Thank you Ricki. The gardenias fade quickly though and that salvia started shedding too.